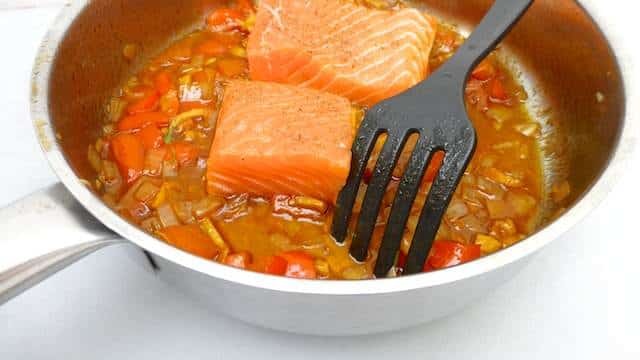 Easy Salmon Recipe Asian Style | Simple. Tasty. Good. An easy salmon recipe with an Asian twist. I was looking for a fresh summer dish for dinner the other night to enjoy after a hot day. Well throw in some grated ginger, fish sauce and lemon juice and you got something totally mind-blowing going on! 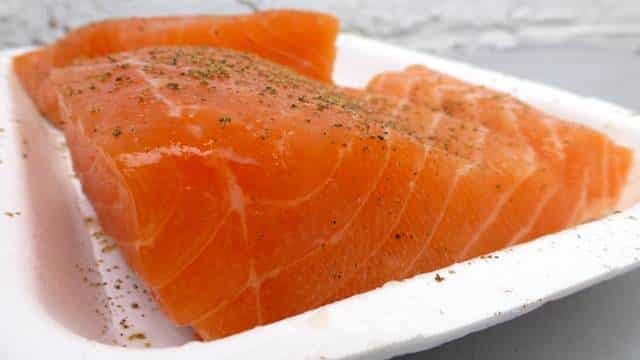 Take the salmon out of the fridge 30 minutes before you intend to cook. Cook the salmon to the doneness you prefer. I like salmon best when it is still raw inside while cooked on the outside. I kept a little of the raw sliced onion and fresh cilantro aside to make a kind of garnishing salad to top the cooked salmon with. Gives it a nice color and texture contrast. I served this dish with rice. Love salmon recipes? Then also check out my Spanish salmon with ham in cider! 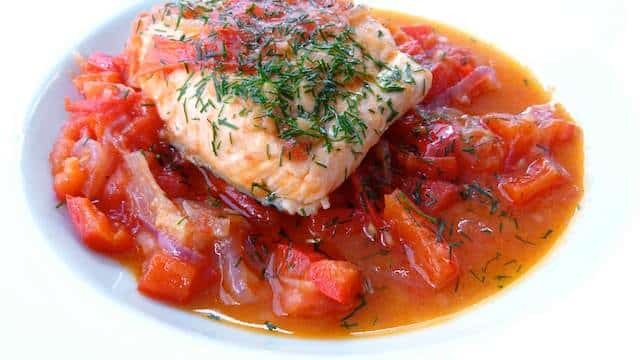 Take the salmon out of the fridge 30 minutes before you intend to cook. Rinse the salmon and pat it dry with some kitchen paper. Then cut the salmon in half and season both pieces with some pepper and salt. Peel the onion and slice it finely. Peel the garlic cloves and mash it up under the blade of your knife. 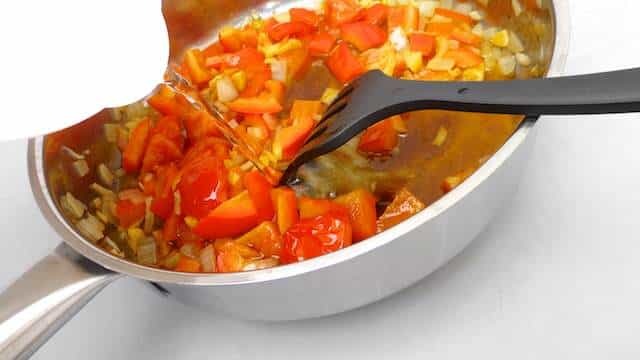 Pour the vegetable oil in a large non-stick pan and place it over medium heat. 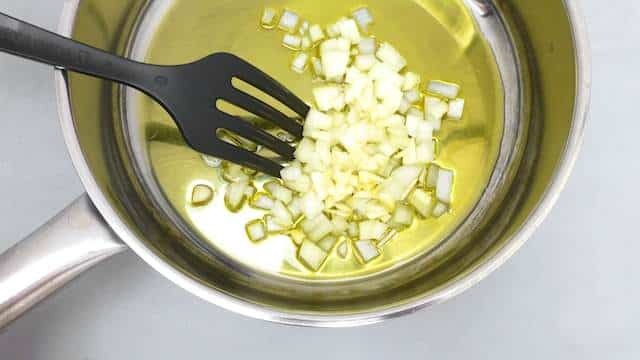 Once the oil is hot enough, then add the sliced onion and mashed garlic. Quickly stir fry the onion and garlic for a minute. 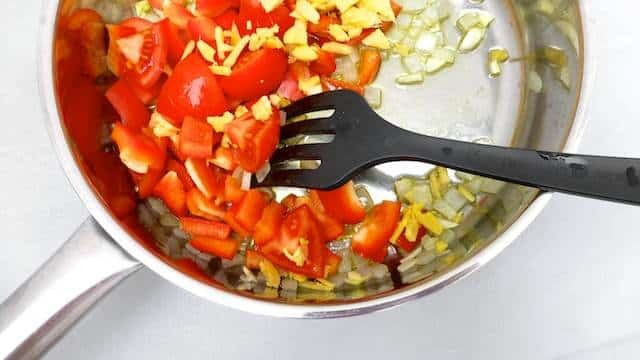 Then add the chopped tomato, red bell pepper and grated ginger. Stir well. 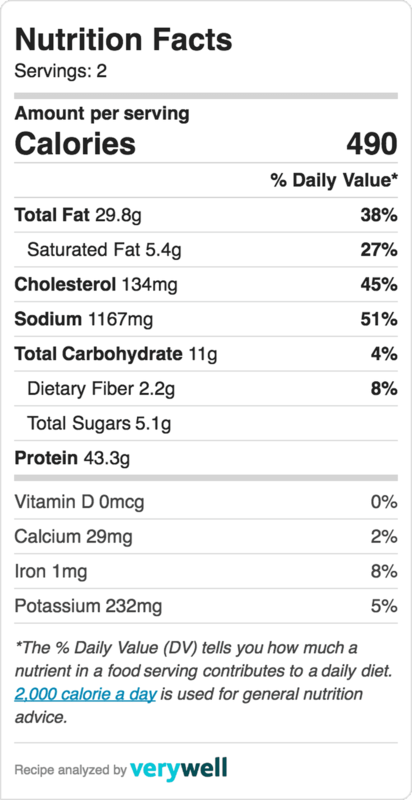 Add the soy sauce, fish sauce, lemon juice and ¼ cup (60 ml) of cold water. Bring this to a simmer and add the salmon. Cover the pan and cook for a couple of minutes. 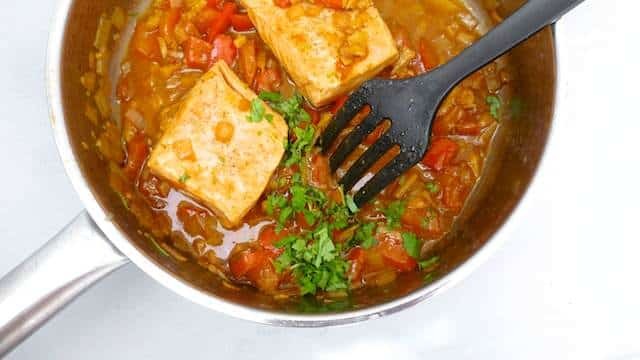 Then turn the salmon regularly and drizzle with the bell pepper sauce. The vegetables should still be a little crunchy. The sauce must have reduced by half. Check the seasoning and add extra fish sauce, soy sauce or lemon juice to taste if necessary. Stir in the freshly chopped cilantro. Then place the salmon onto warm plates and top with the bell pepper sauce. Serve hot.